Are you a travel enthusiast who thinks out of the box and dreams about seeing the wide world? Then you will surely get to see at least some of the destinations on your bucket list, create some amazing memories and impress your grandchildren with your stories when the time will come to sit down with them and rewind your life. But the most important question is “who do you want to travel with”? Who are the most important people in your life? Who do you want to create your memories with? Is it your partner, your children, your parents? Although it is always a good idea to travel with your friends, especially when you are young, it is also important to think about the oldest members of your family. Few people travel with their elders and it is not simply because they have different interests and opinions. One of the main reasons why this happens because of the reduced mobility of the parents or grandparents and the anxiousness that comes with it. But what if you knew that there are portable devices or "vehicles" that you could take with you in your travels and that could help the older members of the family maintain the pace? Would you rethink the entire traveling idea? If the answer is "yes", then you are in the right place. This article brings you the reviews of 5 of the best-selling portable mobility scooters on the market. These are amazing devices that allow you to make the best out of your travels and bring your elders with you. After reading these reviews and analyzing the products, you will come to the conclusion that it takes so little effort to create such incredible memories with some of the most important people in your life. This medical scout that comes at a great price is the proof that mobility can be bought for such a low price! 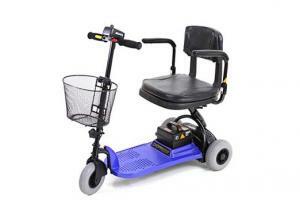 It comes with a great design that is compact and visuallly pleasant, ergonomic and comfortable for the elderly. It is easy to assembly and disassembly and it has interchangeable color panels that are meant to hide any scuff or scratch. It has a swivel seat and a backrest that can be folded down when not needed, as well as a delta tiller that is adjustable. This portable scooter measures 42.5 x 20.5 x 36 inches and weighs 94 pounds, which makes it comfortable to transport and carry around in airports or from the hotel room to the ground floor, where it can be driven by the person it is meant for. What's to like about the Drive Medical Scout Compact Travel Power Scooter, 4 Wheel? The most important advantage of such a scooter is its portability. The fact that it can be stored in your car makes it great for every-day use and for traveling, at the same time. It connects using a battery pack that is easy to recharge when required. The design of its wheel makes it easy to stir, even for people who have lost their dexterity. Also, it is stable and sturdy, which makes you and the driver feel safe. Although this portable scooter is nice and easy to use, it is not exactly suitable for very tall people, giving the fact that it does not have a lot of leg room. If you are looking for a mobile scooter that is incredibly sturdy, portable and comfortable and you don't have a limited budget, this is the right product for you. This is a folding vehicle that comes with a unique design. It is meant to offer any family the portability they need during their travels, regardless if the scooter is being used locally, in airports or while visiting foreign destinations. This folding scooter is easy to store, is equipped with a 270-Watt motor with 4 poles and it has improved stability thanks to its articulated front end adds. It operates using sealed gel batteries. Once charged, they offer the scooter autonomy of 10 to 15 miles. It has 1-inch thick cushioning, folding backrest and a seat that is made of ABS plastic and high-density foam cushion. What’s to like about the EV Rider Transport Folding Travel Electric Mobility Scooter SLA Batteries? There are plenty of reasons why one should consider buying this electric mobility scooter. First of all, it comes with advanced technology that helps individuals with reduced mobility move around safely, by using an S-Drive 45 Amp controller and an electromagnetic brake. The scooter has a 6-degree climbing angle, a 4-6 hours charging time and gel batteries that last for about 10-15 miles. All of these features come with a price. However, this product’s price is a little higher than that of similar products on the market. Yet another medical mobility scooter is brought to the market by Drive Medical, at a rather reasonable price this time. This is an easy-to-adjust vehicle with tiller angle places and flip-up armrests, as well as adjustable seat and a folding backrest. It has a nice, compact design with a metal carry basket in the front side and an ergonomic shape that allows people with reduced mobility to feel comfortable while driving. This transportable scooter comes with an electromagnetic brake system and a great steering system. The Drive Medical mobility scooter measures 42 x 19.2 x 35.5 inches and weighs 84 pounds. It is easy to transport by car and easy to adjust. The maximum weight capacity of this vehicle is 300 pounds. What’s to like about the Drive Medical Bobcat X3 Compact Transportable Power Mobility Scooter, 3 Wheel? First of all, there is the visual aspect. This scooter is nicely designed; it comes with an ergonomic design and a red accent color that makes it even nicer. Second, the technical characteristics of this product are a big plus, especially giving the reasonable price. Also, this vehicle is equipped with all sorts of accessories that are meant to improve the comfort of the driver. Although this is a nicely built vehicle that is great for outdoor use, it only has a 15-degree turn radius, which makes it unsuitable for indoor use, such as the home or stores. 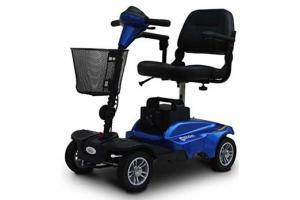 This portable vehicle is meant to satisfy the needs of individuals with reduced mobility that weigh up to 250 pounds. It has a compact, simple design, it is easy to drive and comfortable to sit in, with a handlebar that is easy to reach even by the shorter people. It is battery-operated and it has a quick-connect battery pack. It has a wide turning radius, which makes it suitable for indoor use. This portable scooter measures 37 x 20 x 36 inches and it is considered to be lightweight at its 70 pounds. 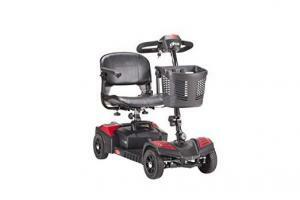 The height of the seat is adjustable, the tires are puncture proof and it is easy to drive and steer. A small basket is present in the front side of the scooter, so shopping becomes an easier task. What’s to like about the Shoprider Echo 3 Wheel Scooter? This mobility scooter is very likeable, thanks to its design, functionality and portability. Also, the fact that it is suitable for short people is a great advantage. The turning radius of this vehicle equals the size of the scooter in a circle, which is great for indoor use. Thanks to the lithium battery pack, this scooter can be transported by plane worry-free. Despite of the fact that this is a high-quality scooter, it does not have the modern features that other similar scooters do, which is why it could be considered a bit expensive by those who are looking for more complex vehicles. Just like the second product on our list, this travel scooter is extremely comfortable, comes with an excellent design and a price to match all the great features. It is easy to assemble and disassemble, it is compact and visually pleasant thanks to the combination of black and blue and it has four wheels that inspire superior quality. It is easy to transport while traveling and easy to drive when at home. When it is not used, it can be easily disassembled and stored into the trunk or anywhere in the house. This mini rider come has a deep cushioned seat that makes the driver really comfortable, especially when sitting down for long hours. Also, it has flip-up armrests and 360-degree seat swivels easily. Also, the height of the seat and the handle are adjustable. Its 400 Amp motor is quite powerful for such a tiny scooter and its cruising range of 15 miles is quite awesome. What’s to like about the EV Rider MiniRider MiniRider 4 Wheel Travel Scooter (Blue)? The EV Mini Rider is a safe and comfortable scooter that allows individuals with reduced mobility to enjoy their rides more and to feel more comfortable while steering. It comes with features that are meant to redesign the scooter cruising experience. The battery pack lasts for approximately 15 miles, the seat swivels 360 degrees, it is lightweight and it is equipped with a 400 Watt motor. Most of this scooter’s features are amazing, but there is one minor flaw that can become annoying and that is the horn. It does not whisper loud enough, so it cannot be heard properly in crowded places. How does a mobility scooter help with independence? Growing old can be both beautiful and difficult, but when mobility decreases more and more, it becomes vey unpleasant for seniors to move around and enjoy life as much as they used to. Most of the times, knees and other articulations, as well as lower back pain is the most disturbing for them. It is easy to understand by younger people how not being able to stand up or walk easily can turn one from a happy, energetic person into a grumpy and frustrated person. 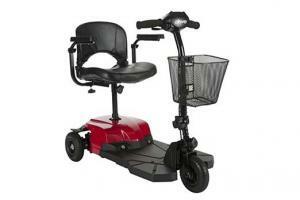 Mobility scooters are quite popular nowadays, as they help the elderly feel more independent. Due to the fact that technology has evolved and these mini-vehicles are equipped with all sorts of great features, a mobility scooter can be used on a daily basis. They allow those who suffer from injuries, surgery or simply from mobility issues due to old age move freely, stroll around the house or neighborhood and continue to see the world as they used to. Being independent is often very important for seniors. They hate to be forced to ask for help for almost everything they need. Going grocery shopping, going out with their friends or simply standing out in the sun becomes much easier this way. Although the idea of using one can be difficult to accept at first, it improves the quality of life. What speed can a mobility scooter reach? Mobility scooters are great. They were built with practicality and safety in mind, so they can’t reach high speeds. Running with one as you would with a car could be extremely dangerous, which is why manufacturers have built their motors to certain limits. There are three main categories of scooters. Class 1 invalid carriage, also known as a manual wheelchair and Class 2 vehicles have an upper speed limit of 6 km per hour or 4mph. It is ideal to use them on pavements. Class 3 vehicles have a slightly higher upper speed limit of 12 km per hour or 8 mph. They can be used on pavements and the road. The great thing about them is that their speed can be adjusted using a controller, which makes it even more pleasant to ride. It is recommended to practice before going out on the road with a mobility scooter, yet once the user is confident, can take it even on a bus or train. Why is it important for a mobility scooter to be portable? Portability is a crucial factor when it comes to mobility scooters. Although the first thing that crosses your mine is the fact that you have to carry it easily into the house or garage, there are even more important things to consider. For instance, consider traveling. If you are planning to go on a trip, the scooter should be stored in the trunk. In lack of portable features, it will occupy a lot of space and it will not be easy to handle. 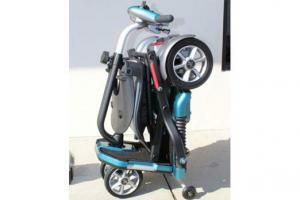 Portable mobility scooters are usually foldable, lightweight and have compact designs. Owning a mobility scooter can make your life and your family’s life so much easier in so many situations. If one of your family members has special needs, has gone through surgery or is too old to move around on their own, such a small vehicle that can be transported anywhere proves to be extremely useful. When owning a portable scooter, you can start planning your trips differently and the worries that usually make you feel anxious about a trip start to disappear, as everything becomes easier. The person who will be using the scooter will benefit from full mobility, will feel comfortable and will be almost independent while visiting tourist objectives, cruising and having a good time. Depending on your budget and requirements, you can choose the scooter that is the most suitable for your needs, taking into consideration the above reviewed products. For instance, if you have an unlimited budget and you want a mobility scooter that has advanced features and is highly adjustable, you can focus on the product number #2 and #5. On the other hand, if you are looking for something within a smaller budget, you can choose between #1, #3 and #4.